From a good maternal line, she really is the one to catch your eye. Her mother is the great old cow below … but like all her female ancestors she’ll be a nightmare until she’s got a calf on her. This heifer is a bit of a ginger girl, and you can really tell. She’s got attitude … star quality. You can see it in her eye and in the way she holds her head … and not content to be an average cow, she seems to want to learn to fly. Properly. Higher. Longer. And with style. So if any of the beasts brought down to the yard for their injections this weekend was going to find itself in trouble, it was her. Well, naturally, there was a nice new bale of silage out there ready for the occasion, and it smelled quite good for breakfast … even to me. And the further she got into it, the better the bit just a little further in seemed to be. In, and in she went. Past her neck. (Ooh … look at THAT bit!) Past her shoulders. (That bit THERE looks tasty!) Past her ribs … until her hips just stopped her going any further and her hindquarters had worked their way into the corner of the pen. There WAS still a way to get back … but it was going to be a bit of a fiddle and it didn’t seem so very appealing. That silage was such GOOD stuff. It smelled and tasted LOVELY! She’d find a way to step back later … but NOT JUST YET. 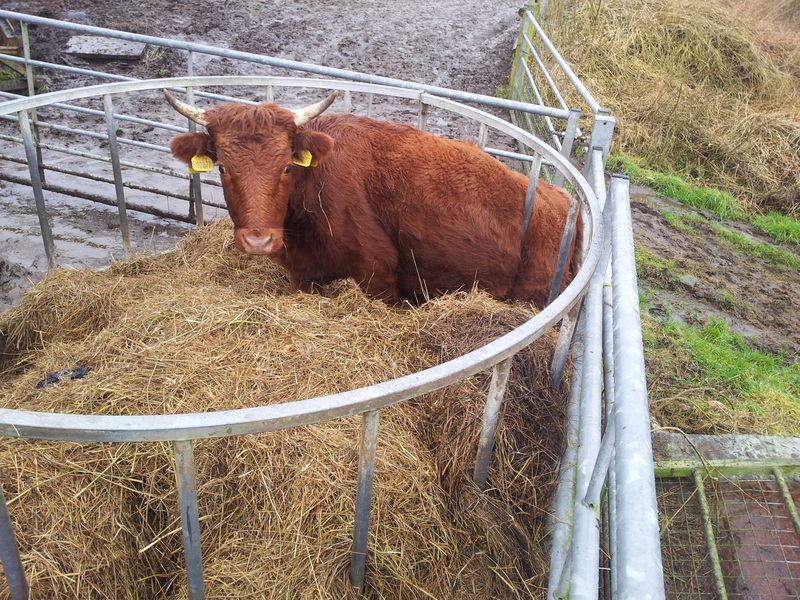 Until her swelling belly-full of silage (by now on the inside of the ring feeder) grew too big to let her go back even if she’d really wanted to … and she was stuck. No, REALLY stuck. She couldn’t stand up. She couldn’t lie down. 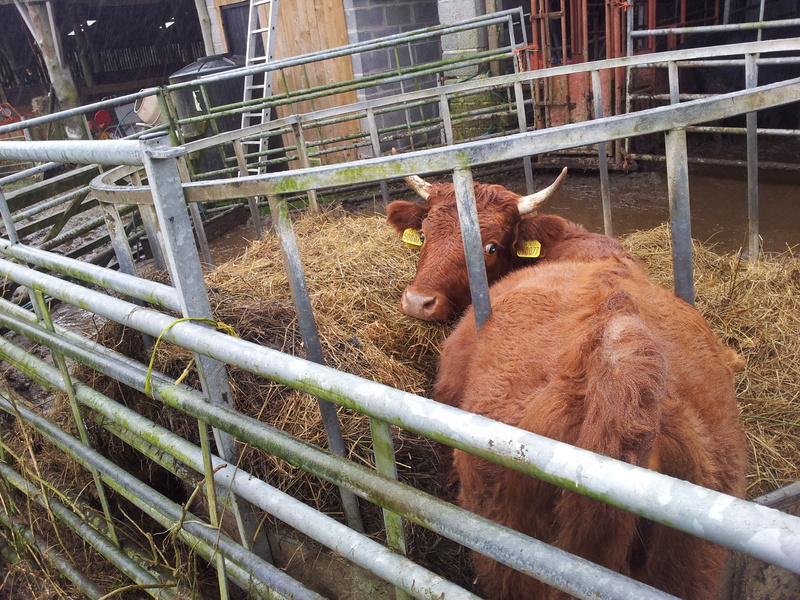 She had a nose full of silage and couldn’t take a morsel more. But she was too sad and too bored to stop eating. STUCK, and getting STUCKER. It took several hours of single-handed sweating and delicate tractor work to spin the feeder with her stuck in it through ninety degrees … out of the corner of the pen … so that she could have backed straight out. But for her belly. And her inability to say ‘no’ to more silage. Which she wasn’t enjoying any more. And which HADN’T made her happy. 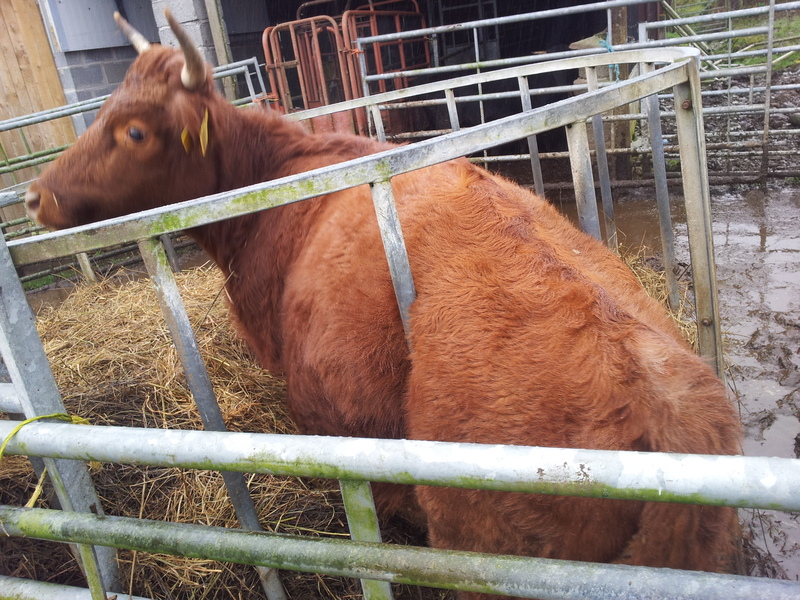 She’d got a serious silage habit now … and she was completely trapped. Lashing out with feet and horns so you couldn’t get near to help her. Miserable with everything and everybody. Stuck. And it was nobody’s fault but her own. There was nothing much for it. The price of greed would have to be paid. Damage would have to be done. And it wouldn’t cost her – only me. It took a jab in the rump to calm her down (and a half hour wait for it to take effect), then a sprint with the hacksaw in the darkness … and a long sleep for the sedative to wear off. When she woke up there was a toothy gap in the feeder, she’d been liberated and was thoroughly FREE! 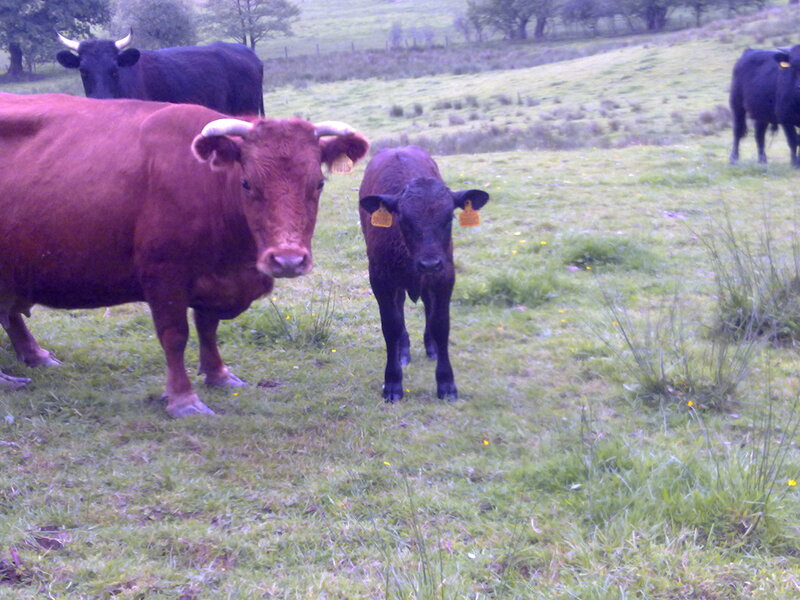 And if you’re thinking, ‘silly heifer’ … just hold onto that thought. Because not many of us are much wiser. ‘No’ is still the hardest word to say to yourself. And while we might not get stuck in the feeder, we readily get stuck in our sin. Where’s this going from here? It’s taking us to the message of Easter, with Christ’s death on the Cross to spring out of their particular ‘prisons’ a race of PEOPLE who’d got themselves so decisively stuck, and were thrashing and kicking against Him. Don’t you think this could be the start of a very Happy Easter? 2 Responses to Sticky. Stuck. Stucker. (Sucker). Thanks Alison. Appreciated! Makes the dark night dash with the hacksaw seem worthwhile, somehow. (Now).